Start October right with a happy belly! Pump up the new month with these exciting eats, from fusion local-European cuisines to a new take on Singapore’s famous Bak Kwa. We present to you Suki-Ya KIN, a premium edition of the popular shabu shabu joint, Suki-Ya. Located in the bustling area of VivoCity, this Japanese joint lets you indulge in an all-you-can-eat shabu shabu and sukiyaki at a starting price of $18.90++, complete with a beautiful scenery of Sentosa waterfront. Besides the usual vegetable bar, Suki-Ya KIN steps up its game with high quality ingredients such as beautifully marbled Wagyu Beef, Kurobuta Pork, juicy Tiger Prawns, fresh Sashimi, and Maki. This gorgeous Japanese-French fusion restaurant with a green foliage feature wall is the latest addition along Craig Road. Have your dinner at the main dining area or have a couple of drinks at the bar. There is even a private area for business meetings or a birthday bash. The beautifully-plated dishes are handcrafted by renowned Japanese chef, bringing you the most authentic fine dining experience. Come October 1st, they will be serving Bara Chirashi at a special opening price of $28++ and complimentary desserts too! Head down to Gustoso Ristorante Italiano for comforting Italian food and excellent service. The cosy family-friendly ambience makes one feel welcomed and at home. Their popular Lobster Pasta and oven baked pizzas are must-tries when you visit. One of the new dishes, the tender Grilled Iberico Pork Rack, consists of seasonal vegetables, roasted potatoes infused with herbs, and a drizzle of flavourful jus. It’s too good to resist! Spanning across 8,300 square feet, this large space is a one-stop shop for dining, wining, and grocery shopping. Part of the space features an in-house florist, Fleurs & Buds and a bakery that whips ups freshly baked goods. Stock up your grocery basket at the wholesale seafood and meat market. After shopping, remember to drop by the yakitori, sushi, sashimi, and oyster bars to fill your bellies. The restaurant serves a variety of Japanese, Western, and Chinese cuisines, giving you more than enough options to choose from. Chill at the al fresco dining area with your friends and enjoy the lush greenery. Can’t make up your mind on what to eat? Order the crispy and tender House Fish & Chips, Grilled Spanish Octopus, or Alaskan King Crab, which are perfect for sharing. Dine with a magnificent bird’s eye view of Singapore city skyline on the 70th floor of Swissotel the Stamford. From the freshest seafood to perfectly seared cuts, this contemporary restaurant offers an international fare with a touch of Japanese element. Tuck into their signature dish, Uni Saffron Risotto, a buttery Arborio rice cooked to creamy, fluffy perfection, topped with a generous serving of uni. The Chopped Angus Beef is lightly seared and served with carrots, spinach, and caviar, giving off a rich flavour that will satisfy your taste buds. Delicate and soft, the Caramelised Soy Bean Cheesecake is to-die-for. It will probably be the best cheesecake you’ve ever tasted. More than just “Bak Kwa”, The Bee Cheng Hiang Grillery is a brand new concept store with the intention to engage their customers and elevate the Bak Kwa experience. Get freshly made pork floss on the spot or experience barbecuing your own Bak Kwa. Try unique tapas inspired by their signature Bak Kwa and flosses at the dine-in bistro area. Savour the Mozzarella Katsu, premium gourmet Bak Kwa wrapped with cheese and then coated with bread crumbs. Play around with the DIY Sliders and get your creative juices flowing as you create your own customised mini Bak Kwa burgers with caramelised onions, quail eggs, and house-made sambal mayonnaise. Who knew Bak Kwa incorporated into our savoury sides would be so finger-lickin’ good! While only tapas are available for the time being, rumours have it that they’re adding enticing mains to the menu towards the end of the year, so keep your eyes peeled! Select your favourite wine from the in-house cellar and pair it with your Bak Kwa dishes. If you don’t fancy wine, quality beverages such as TWG tea or Illy Coffee are available to go along with your sides. Located in Tanjong Pagar, The Obelisk is a kitchen and bar concept, which changes their menu every four months. Currently, the restaurant bar offers local-European fusion food, paired with bespoke cocktails inspired by local flavours. Share platefuls of Grilled Prawns with Kimchi Pesto and Sriracha Mayo or House-made Otah of Prawn, Squid, and Mackerel with Papaya Salad. Meat lovers will definitely enjoy the tender Hanger Steak. The slick rose gold interior adds a beautiful touch to the ambience, which is great for a relaxing night. Wind down with creative cocktails such as the Mindaro cocktail and Yuan Yang cocktail. Spend quality time with your furry friends at this cosy, pet-allowed cafe in the quiet area of Jalan Gelenggang in Thompson. If you are looking to hang out with your friends or spend alone time, Canine Cafe is the place to go. The all-day breakfast menu offers fluffy Mushroom Omelette, Magnum Breakfast and more. Salted Egg Wings and Candied Bacon Mac and Cheese are great for sharing. Not forgetting your furry companions, Canine Cafe features a pet food menu just for them! Now both owners and fur babies can indulge in a scrumptious meal on a lazy weekend. 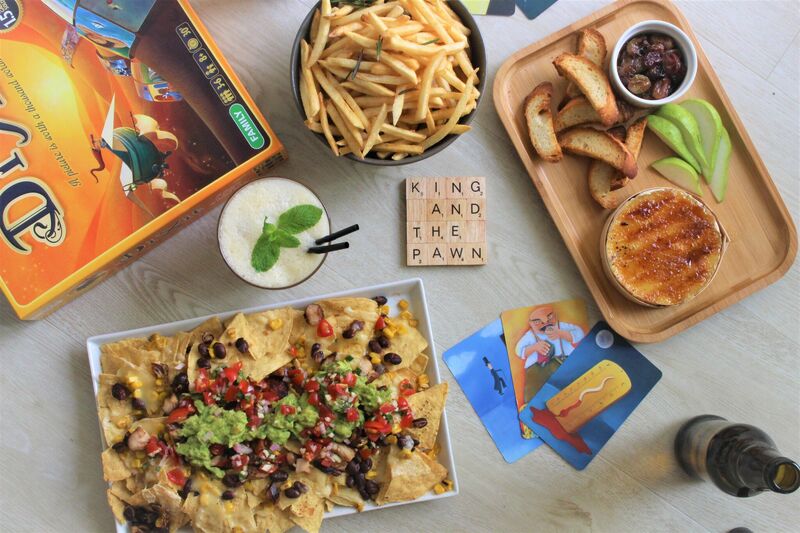 King and the Pawn is the newest spot where they combine food, drinks, and board game entertainment all in one place. This unique cafe serves up American fare with a playful twist and locally roasted coffee. During weekends where they open till 2am, spend the night drinking craft beers and cocktails with your buddies while cracking your brain over board games. With over 300 board games to play, you’ll never get bored of this place. Share with your friends, this may be your new hangout activity! San Lou is a cool, modern bar with an Asian twist. They offer a full range of wines, beers, cocktails, and non-alcoholic beverages, suited for anyone who wants a chill night with friends. There is a huge variety of activities to entertain everyone such as karaoke, pool, darts, and board games. Feeling hungry? Their menu includes Fried Chicken Spam Fries and San Lou Chicken Wings with Homemade Spicy Dip. Wash the savoury bites down with a glass of McWilliam’s Sauvignon Blanc or a Pint of Ice Cold Erdinger Draft Beer. Located at NTU Alumni House in one-north, enjoy a lovely meal with your loved ones at this family restaurant with a cosy dining ambience. They offer delectable mains such as the Smoke Salmon Pasta with Cream Sauce, Golden Fish and Chips, and Ikan Bilis Fried Rice at an affordable price. Good news for the parents, Three Degree Cafe has a children’s play corner filled with books, building blocks, and kitchen toys to keep the young ones busy while you are eating. If you are looking for a space to plan a party, why not consider here as a venue? They provide full-scale planning and customisation of theme menus for your special occasion. Now you can just party away! Located just a few minutes away from Tai Seng MRT Station, YCC Home Kitchen provides a wide selection of Chinese zi char dishes cooked with the freshest ingredients. Satisfy your cravings for grandma-style, homey fare with their Curry Fish Head, Salted Egg Chicken, Hakka Style Tofu, and more. The dishes are reasonably priced and are of good quality, you’ll surely be contented with the meal. While SBCD Korean Tofu House isn’t exactly new, we were excited to hear about their latest savoury, summer flavour menu coming out this month. Try the crispy Chicken Karaage Tempura Soontofu, Prawn Tempura Soontofu, or Dumpling Tempura Soontofu. Soak up the summer vibes with the tangy and sweet, refreshing Orange Chicken as well as the flavourful Unagi. The soft and silken tofu is freshly made in the SBCD kitchen daily and the 10-ingredient soup secret recipe is what makes customers come back for more!